THE world’s largest ships have a significance far beyond that due to their mighty engines and impressive bulk. Thousands of tons, driven hundreds of miles a day, to destinations on the other side of the world - that is, indeed, an example of man’s mastery over the forces of Nature. A great liner is the largest self-contained and self-propelled unit of man’s making; she fittingly represents the peak of human achievement in large-scale, long-distance transportation. Consider for example the Stirling Castle. At 4 pm on a Friday afternoon she lies alongside the quay at Southampton. As the clock strikes the hour the last gangway is withdrawn, the last hawser is let go, the water churns beneath the stern as the screws revolve - and about 1,000 people are detached from their fellows to form a self-sufficient, floating world of their own. A fortnight later the beautiful great vessel enters the harbour at Capetown, 6,000 miles away. Throughout that long voyage her little world of inhabitants has been housed and fed in the utmost comfort. They have been sheltered, warmed against the cold or fanned in the heat; they have been entertained and provided with all the amenities of a well-equipped hotel. 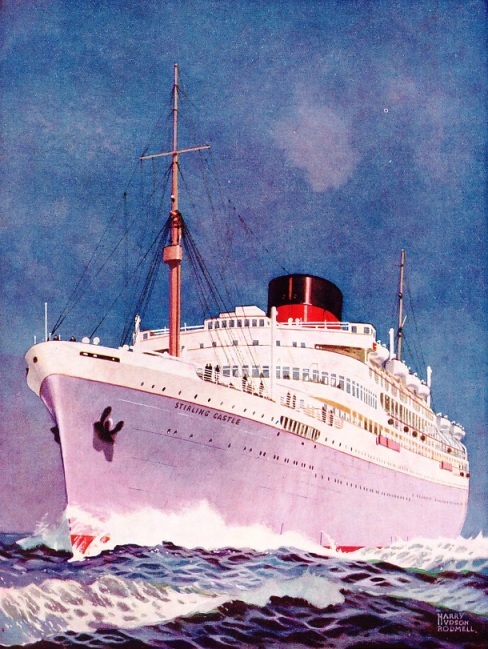 While sleeping in comfortable beds, walking on broad and sheltered decks, or lounging in luxurious rooms, they have been carried thousands of miles with such speed and efficiency that many of them will not realize that their punctual arrival in South Africa represents a modern miracle of transport. The great liner lies alongside in Capetown for about a day and then heads out to sea again to complete her voyage. A few days later, after calls at Port Elizabeth and East London, she noses past the Bluff at Durban, having rounded Africa’s southernmost extremity and traversed 800 miles or so of the Indian Ocean. Nine days later she will slip quietly out to sea again, bound for England with passengers, mail and cargo. One of the world’s great ships, she moves without fuss on her lawful occasions; and later only a line in the newspapers - “Stirling Castle arrived Southampton” - will record her achievement. Not many will pause to consider what manifold applications of science have contributed to the feat so tersely recorded. Fewer still will reflect on the unremitting effort required to run a regular service of mail vessels, forming a continuous bond between the countries concerned. The Stirling Castle is but one link in the endless chain of communications joining Great Britain with South Africa. As the one vessel arrives at Southampton a sister ship will be arriving at Capetown, and other vessels on the service will ply between British and South African ports, “swift shuttles of an Empire’s loom, that weave us main to main”. We can appreciate the significance of the one vessel’s performance only if we visualize her as a unit in such a service. The Stirling Castle is a fast new twin-screw motorship. She and her sister, the Athlone Castle, were, at the time of building, the largest and fastest vessels running regularly to South Africa. Launched at Belfast in 1935 by Harland and Wolff, the Stirling Castle has a gross tonnage of 25,550. She measures 680 feet between perpendiculars, 725 feet overall, and has a breadth of 82 feet. Her curved stem and cruiser stern, her two masts and streamlined red funnel with a black top, and her attractive lavender-grey colouring combine to make her a delight to the eye. Structurally she has the fundamental simplicity of a great work of art. There are four complete steel decks, and spacious Promenade and Boat Decks, as well as Orlop and Lower Orlop Decks. There are three cargo holds forward and four cargo holds aft, with corresponding cargo ’tween decks. Ordinary cargo is carried in Nos. 1, 2, 5, 6 and 7 Lower Holds. The remaining holds and ’tween decks are insulated and arranged for the carriage of deciduous and citrous fruits, in which there is a large trade from South Africa. Some of the compartments are arranged for chilled and frozen produce. Altogether a total insulated capacity of about 330,000 cubic feet is provided. The Stirling Castle is divided into twelve watertight compartments by eleven massive bulkheads, all of which extend to C Deck. Under the holds is the continuous double bottom - a ship within a ship - forming tanks arranged to carry fresh water, water ballast and oil fuel. The deep fresh-water tank is between the shaft tunnels in No. 4 Hold, and the deep fuel tanks are arranged athwart-ships, forward of the auxiliary machinery space. The total oil fuel capacity of the vessel is about 3,900 tons. The arrangements for cargo are interesting. Considerable loads are carried, and must be handled with all the expedition demanded of a vessel which flies the pendant showing that she carries the Royal Mails. The cargo hatches to the seven holds are served by fifteen tubular steel derricks, including two of the 12-tons type and one of the 30-tons type at No. 2 Hatch, where the specially heavy loads are handled. The derricks are worked by sixteen electric winches, those at No. 2 Hatch being of special heavy-duty type. On D Deck there are an electrically-driven warping winch forward and two electric warping capstans at the after end. The streamlined semi-balanced rudder is operated by electro-hydraulic steering gear. Below the load water-line all the watertight doors are of the electric-power-operated type, controlled from the navigating bridge. accommodation there are a sprinkler extinguishing system and “firefoam” extinguishers. Fire-resisting bulkheads, with the necessary fire-doors, are installed to enable any outbreak to be localized. The heart of the ship, beating rhythmically and powerfully from port to port, is the engine-room. Here is housed machinery of unusual interest. When built it constituted a power record for British mercantile marine motor installation - 24,000 shaft horse-power. The main engines are of the Harland-Burmeister and Wain ten-cylinder, double-acting two-cycle type. With a diameter of 660mm and piston stroke of 1,500mm, they embody the special features of airless injection of fuel, uniflow scavenging and tuned exhaust. Some idea of the importance and complexity of the work in the main and auxiliary engine-rooms can be gained from the fact that, apart from the main engines, there are about fifty electrically-driven auxiliary power units in operation. These include four main and two auxiliary salt-water circulating pumps, four main and two auxiliary lubricating oil pumps, two main and two auxiliary fresh-water circulating pumps, all the bilge and ballast pumps, as well as those for the fresh- and salt-water supplies, oil pumps, forced-ventilation fans and air compressors. To supply the continual heavy demands for electricity a generous reserve of power is provided by an installation of five diesel generator sets. Each set is capable of delivering 700 kilowatts at an easy rating. The complete power station thus compressed into the engine-room is fitted with all the equipment required for efficient main-tenance of all services while at sea. Over the main engines are electric travelling cranes, in the workshop are lathes, and a passenger lift connects the top of the engine-room casing with the top and bottom engine-room platforms. At the starting-platform level is a silence cabinet, having telephones communicating with the bridge, Chief Engineer’s room, top of engine-room casing and the emergency dynamo compartment. The various dials, indicators and telegraphs in the heart of the ship convey an overwhelming impression of immense power under perfect control. In sharp contrast to the dark-gleaming austerity of the liner’s power centre are the public rooms and passenger accommodation, divided between first class and cabin class. The vessel carries 297 first-class passengers, in single and two-berths rooms fitted with cot beds. Many of these rooms have their private bathrooms adjoining. Some of the cabins are fitted with disappearing beds, so that in the day-time they can be used as sitting-rooms. In the cabin-class accommodation provision is made for 492 passengers, in two-, three- and four-berths rooms. In all the cabins hot and cold running water is available. All the passenger decks are overlaid with rubber, and in the main public rooms and cabins there are rugs as well. The Stirling Castle has accommodation for a crew of 414, the total accommodation thus being 1,203. Throughout the public rooms and in all passengers’ and crews’ quarters electric heating is installed. The powerful ventilation system ensures that in the hottest weather every part of the vessel is kept comfortably cool. In the cabins the electrically-driven ventilating fans are under the control of individual passengers. The Stirling Castle was the first ocean liner in which the Harlandic clock control system was installed. This system keeps correct ship’s time during the whole voyage, thus obviating the necessity for putting the clocks forward or back at a certain time daily to conform with the ship’s movements east or west of the Greenwich meridian. The hands of the clocks move continuously instead of in half-minute or minute jerks, and the system is noiseless. Another interesting instance of the elimination of noise is provided by the luminous system of communication with the stewards’ department. Outside the door of each stateroom are two small electric lamps, one red for summoning a steward and the other green for summoning a stewardess. Inside the room are installed pushes of corresponding colours. The operation of a push lights the appropriate lamp outside the cabin and in various parts of the vessel to show that the services of a steward or stewardess are required. The lamp remains burning until the attendant reaches the door of the cabin and operates another control push there. Silent and efficient service is thus ensured. The public rooms of the Stirling Castle have dignity and spaciousness. Choice South African woods are appropriately used, and the latest forms of electric lighting have been embodied with pronounced success. In the public rooms all the lighting is indirect, the Stirling Castle having been one of the first British vessels to adopt, this feature. O f the public rooms in the Stirling Castle, pride of place goes to the first-class lounge, situated at the fore end of the super-structure, below the bridge. Other public rooms in the first-class accommodation include a dining saloon, card room, drawing room, smoking room and veranda. There are also a gymnasium and swimming pool. Cabin-class passengers have a children's dining saloon, in addition to the main dining saloon. There are also a lounge (containing a library), writing room, children’s playroom, smoking room, veranda and outdoor swimming pool. 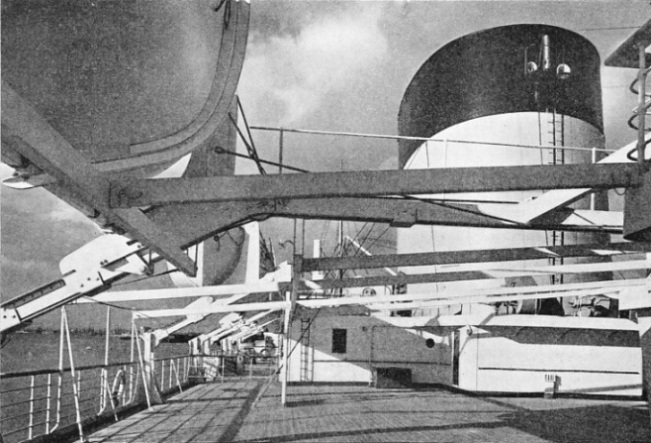 While the passengers, in these attractive surroundings, engage in the varied activities of a long voyage, the work of the ship must go on almost unnoticed. Below, the engineering department continually watches all the multifarious machinery in its charge. On the bridge the navigating officers keep their control and ceaseless check on the vessel’s course. In the wireless room messages are continually coming and going, for the ship is never out of touch with other vessels or the land. A hive of specialized and co-ordinated activities, the Stirling Castle of to-day bears but little resemblance to her predecessor, the sailing ship Stirling Castle of the year 1863. In the previous year the founder of the Castle Line - the late Sir Donald Currie, G.C.M.G., M.P. - began his own business as a shipowner, after having served with the Cunard Company. Preferring not to enter into competition with his former employers, Mr. Currie - as he was then - founded a service of sailing ships between Liverpool and Calcutta. The first of these vessels were the Stirling Castle, Tantallon Castle, Carnarvon Castle and Kenilworth Castle. The leading dimensions of the Stirling Castle, which was of 1,165 tons, were length 200 ft 7-in beam 33 ft 8-in and depth 22 ft 7-in. After about ten years experience in the Calcutta trade, Mr. Currie decided to substitute steamers for the sailing vessels. He built the steamers Edinburgh Castle, Windsor Castle, Walmer Castle and Dover Castle. While these steamers were under consideration Mr. Currie altered his intentions as to their future employment and decided to run them in the South African trade. Until the Castle packets were completed and equipped he placed the steamers Iceland and Gothland in the service between Southampton and the Cape. Starting her first voyage on January 23, 1872, the Iceland was the pioneer steamer of the Castle Line. The Castle Line received an allowance from the Cape Parliament tor the carriage of letters, and when the postal contract was renewed in 1876 the mail service was equally divided between the Union and the Castle Lines. The Union Line was the elder, having been formed in 1853 under the title Union Steam Collier Company. Thus the two important fleets which in 1900 became the Union-Castle Mail Steamship Company had individual histories reaching back for half a century. Their respective original house flags have become the house flag of the Union-Castle Company, as shown on the colour plate between pages 404 and 405. The Union Steam Collier Company began modestly with a fleet of small steamers - the Union, 336 tons; Saxon, 440 tons; Britain, 491 tons; Dane, 530 tons ; and Norman, 530 tons. How the little colliers found more profitable employment as transports during the Crimean War, how they ran for a time to Brazilian ports, and how eventually the Company - then calling itself the Union Steamship Company - secured the mail contract to the Cape, is but a part of the romantic story of South Africa’s mail service. That story unfolds itself as a triumphant progression, culminating in 1936 with the record run of the Stirling Castle. Leaving Southampton on August 21, and arriving at Capetown on September 4, she made a record passage of 13 days 6 hours 30 minutes, including a stop of three hours at Madeira, at an average speed of 18.9 knots. 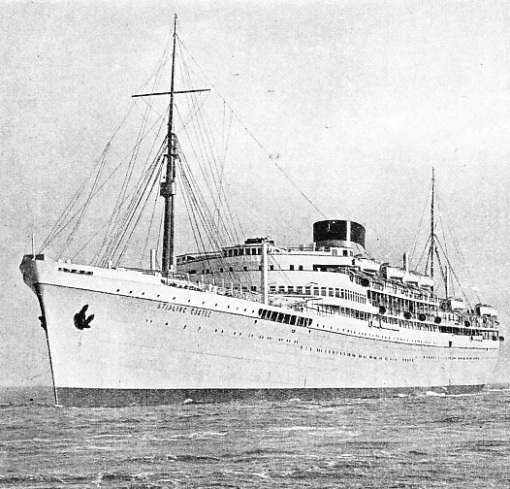 The Stirling Castle, thus taking her honourable place in the history of the maritime mail service to South Africa, represents not finality, but the spirit of progress which ever urges man forward. Her speed, her size, her power and every detail of her design make it impossible to compare her with the Stirling Castle of 1863. Every detail is different, save two. On her bows she bears the same proud name, Stirling Castle. And she is driven by the same force - not electricity, nor steam, nor sail, but the compelling and indomitable spirit of man. ONE OF THE LARGEST MOTOR. 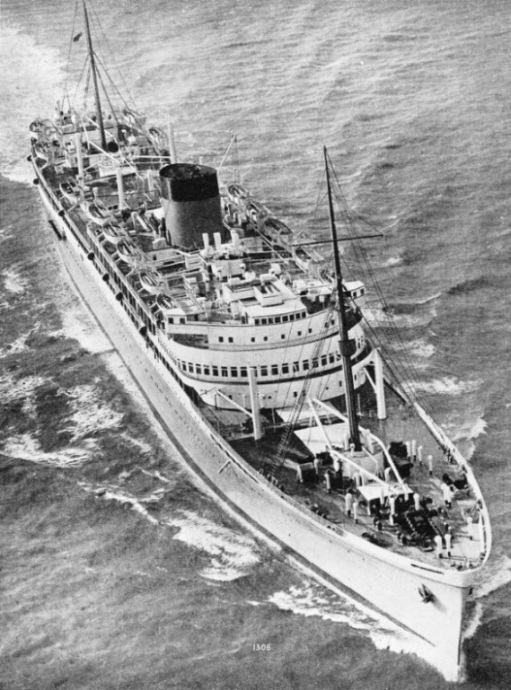 SHIPS IN THE WORLD, and at the time of her building, the largest vessel in the South African service, the Union-Castle liner Stirling Castle is propelled by ten-cylinder double-acting two-stroke cycle diesel engines of the Harland-Burmeister and Wain type. These powerful motors develop a shaft horsepower of 24,000. About fifty electrically-driven auxiliary power units also are used in the ship. INDIRECT LIGHTING is one of the main features of the public accommodation in the Stirling Castle. One effect is to enhance spaciousness, as shown by the photograph (above) of a portion of the first-class lounge. This remarkable room is situated at the fore end of the superstructure and thus a fine view of the sea is obtained through the forward windows. ELEGANCE AND COMFORT are keynotes of the interior decoration of the Stirling Castle. 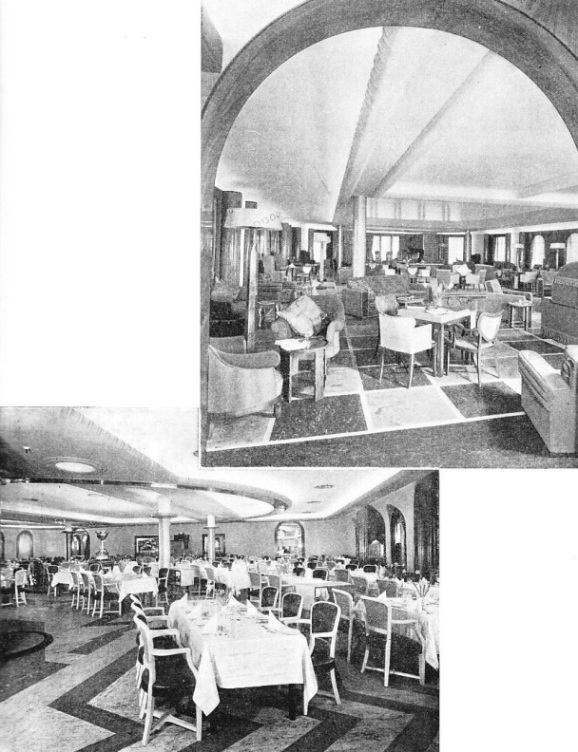 The first-class dining saloon (left) is an excellent example of the dignity and harmony that are characteristic of the vessel. This effect is heightened here, and throughout the ship, by the use of indirect and concealed lighting.